man gets 15 years for two joints in philippines as 'reefer madness' continues to rage worldwide. A Philippines court in Cebu City has sentenced Emilion Lapay Jr. a local man, to 15 years in prison for possessing just two joints, according to a report in the local newspaper the Cebu Freeman. After a trial in which the only evidence was the word of two police officers, Judge Ingles ruled Lapay was "guilty beyond reasonable doubt," and sentenced him to 15 years in prison. But in a magnanimous gesture, the judge left open the possibility he could be free in only 12 years. People caught in the Philippines with more than 500 grams of cannabis (a little more than one pound) face a possible death sentence, while possession of as little as five grams is punishable by life. Small time offenders possessing less than five grams face 12 years. Meanwhile China has launched a 'Peoples War' against drugs. This can only mean one thing; more executions for cannabis. Last year China celebrated the UN 'International Day Against Drugs' (28 June) by executing 231 people found guilty of drug trafficking. In the United States, home of reefer madness, and private prisons profiting from the prohibition of cannabis, there are over 600,000 people in prison just for marijuana related offences. In Sweden you can be arrested by police just for looking like you might be a cannabis user. Unfortunately, 'reefer madness' is still alive and well and raging world wide. The virus, which effects the brain and can be spread by the written word, is at large in Britain too judging by the recent outpourings of some of the British press who are known carriers of the mental disorder, which has been tragically known to strike down politicians in their prime, for example Ann Widdecombe. Know about a crazy bust or a choice example of reefer madness? 'News of the Weed' wants them now. Every one we use gets a free copy of 'Council Flat Paradise' the guide to growing weed in a council flat. The Star in Malaysia reports that Ahmad Saidin, a 57 year old carpenter, has been found guilty of having 1.6kg of cannabis and has therefore been given the mandatory sentence of death under Malaysian law. Malaysia has executed 358 prisoners by hanging in the past 24 years mostly for drug-trafficking. During a recent debate in the Malaysian parliament (April 05) on how to handle drug addicts there was a suggestion that addicts should be supplied with drugs by the government and exiled to a remote island. The case of Ahmad Saidin is just the latest in a long line of tragic cannabis executions in several parts of the world especially China, Singapore and Malaysia. Amnesty International has pointed out that the people who are caught and hanged are usually the poor in society. Meanwhile the big dealers enjoy the liberal banking laws. Recently there was the case of Shanmugam s/o Murugesu in Singapore who was hung for just over a kilo of cannabis on May 15 2005. But while users and small time dealers are executed on a regular basis in this corrupt nation ruled by criminals, major drug barons dealing in heroin continue to operate untouched, and make an significant contribution to Singaporean state coffers. One such druglord is Lo Hsing-han, a Burmese heroin producer who has massive business interests in Singapore with the full support of the government that executes people for cannabis. Meanwhile Malaysia's hangmen and floggers are celebrating they have been granted a pay rise. Hangmen will get a 60% rise. For every hanging they will now be paid 500 ringgit ($131) instead of the current 300 ringgit. For every swing of the cane, floggers will now get $3.30 - up from $1.10. 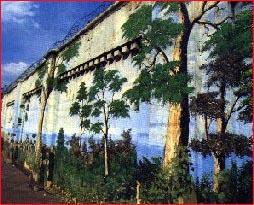 Above: The surreal mural wall of Pudu Prison, Kuala Lumpur from the website of international anti death sentence campaigning organisation Save A Life. SOMETHING MUST BE DONE. Boycott Singapore and Malaysia. Any ideas? Watch this space. The Washington Post is reporting that U.S. Drug Czar John Walters, and Dutch Health Minister Hans Hoogervorst, have reached an accord on dealing with "high potency marijuana" and announced plans to hold a 'skunk summit' this autumn. Heaven knows what they will come up with, but 'News of the Weed' will be there. According to the Washington post the 'skunk summit' is being held because of concerns about a "new high-potency form of marijuana, known as THC, because of its psychoactive ingredient delta-9-tetrahydrocannabinol." The US Drug Czar is quoted saying that on his visit to Holland he had discovered that "20 percent of homegrown marijuana was THC." Very scientific sounding, but as almost every 14 year old in Britain knows THC is just one of many active ingredients in ALL cannabis, not some new chemical produced only by 'skunk' plants. Seems like what they need is some CANNABIS EDUCATION. "it is not obvious that more potent forms of cannabis inevitably have more adverse effects on users' health than less potent forms. Indeed, it is conceivable that increased potency may have little or no adverse effect if users are able to titrate their dose to achieve the desired state of intoxication, as some have argued they do (e.g. Kleiman, 1992; Mikuyira and Aldrich, 1988). If users were able to titrate their dose, the use of more potent cannabis products would reduce the amount of cannabis material that was smoked, which would marginally reduce the risks of developing respiratory diseases. "[ . . .]even if users do not titrate their dose of THC, (or if they do so inefficiently), any increase in the average dose received would not inevitably have an adverse impact on users' health. The effect would depend upon the type of health effect in question, and the relative experience of users." 'News of the Weed' will be watching to see if the Australian 'Department of Health and Aging' is invited to participate in the promised 'skunk summit'. The excellent Latin american blog 'NarcoSphere' believes that the Dutch may be caving in to American pressure, and they may be right, but perhaps (hopefully) something else is happening. The Dutch may want to humor the Americans especially after they recently withdrew their troops from Iraq. However they have steadfastly stood by their sensible and rational drug policies through years of attack from all sides. This new agreement paves the way for a summit between U.S. and Dutch researchers, information sharing between drug addiction experts and the assignment of a Dutch researcher to the American 'National Institute on Drug Abuse'. It may just be possible that the Dutch are about to give the American Government the Cannabis Education they so clearly need. We will be watching. In a medical cannabis case which is begining to have international repercussions American cannabis exile Renee Boje is currently fighting a fast track extradition order from Canada to the US and she needs your help. The US federal authorities want to imprison Renee for a 10 year MANDATORY sentence in a federal prison, basically for watering some pot plants for a medical marijuana patient in California, where medical marijuana is legal under state law. 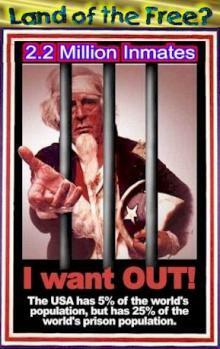 On June 17, 2005 the Canadian Minister of Justice, Irwin Cotler, ordered Renee Boje surrendered to the US authorities. Renee surrendered herself into custody, but was thankfully released on bail pending an appeal to the Canadian Court of Appeals. They are now waiting to hear whether or not the appeal will be accepted. In order to ensure Renee Boje's freedom in Canada, she and her lawyer will have to convince the Canadian Court of Appeals that to surrender her to the US authorities to serve a lengthy prison sentence in a violent and inhumane US prison would shock the conscience of Canadian citizens. There may be hope, as Amnesty International, the UN and Human Rights Watch have all condemned womens prisons in the US due to the extreme violence & inhumane conditions that women are enduring in American prisons today. As part of the campaign to free Renee Boje and spread information about her case, a free song download has been created where you can get the excellent protest track RENEE AND THE DRUG SQUAD by Johnny Punish and the Shabbab. Please forward this link and information to others who may be interested in doing something about this important case. The Scotsman has an historical item about Boy George's 'guest star' appearance as a member of the 'A Team', involving the consumption of a "huge marjuana spliff" EVERY morning. In an especially surreal episode of the popular 1980's TV series, entitled 'Cowboy George' ('A Team',1986), an ultra camped up 'Boy George' explains to lovable if macho hulk 'Mr T' how to kick a door down. As an ex South London squatter 'Boy George' may have known almost as much about this as 'Mr T', who was super cool, previously being a body guard for Muhammed Ali, and once saying unscripted "When I was growing up, my family was so poor we couldn't afford to pay attention". Apparently however cool Mr T was, Boy George had mixed feelings about being a member of the 'A Team' which was full of gratuitous violence and bad jokes. The Scotsman quotes him saying; "I'd get up every morning, have a huge marijuana spliff and just get through it." What he does not mention is if he shared his "huge" spliffs' with anyone else on the 'A Team'. Of course the chronic early morning consumption of 'huge spliffs' is not to be recommended, being the 'cannabis alcoholic' version of having whiskey every morning for breakfast, although not nearly as damaging. However most cannabis users have shared Boy Georges early morning 'huge spliff' experiences at some point, if not often. But, unlike alcohol drinkers with a hang over using the 'hair of the dog' recovery method, early morning cannabis users are not recovering from the previous nights abuse of a dangerous drug by taking more of the same. They just want to get high as early as possible. For cannabis users the danger can come if they are starting the day as they intend to continue on a regular basis, which means they may end up not getting out of bed at all. This may be the safest place in these troubled times, but regular smokers of a strong type of skunk actually called 'Chronic' may be at particular risk of bed sores. For those who do not remember the 'A Team', it was a 1980's TV series for kids featuring crazy 'don't do this at home' stunts and psychopathic violence by a 'likable' gang of mercenary killers cracking jokes. One of the side effects of watching the 'A Team' for some young people was almost certainly hearing voices. For parents however, the worst mental health effect was the 'A Team' reenactments all over the house, including 'armed' assaults on the front door, thanks to Boy George, much as we love him. 'Under the Influence' is a listing of people through the ages who have allegedly made an important contribution to the arts, politics, religion, science etc and have used cannabis, or advocated the ending of cannabis prohibition. Contributions (with evidence) always welcome. In an important development in the United States, more than 530 distinguished US economists have signed an open letter to President Bush and other public officials calling for "an open and honest debate about marijuana prohibition' adding, "We believe such a debate will favor a regime in which marijuana is legal, but taxed and regulated like other goods." They are endorsing an academic paper entitled "The Budgetary Implications of Marijuana Prohibition," by Dr. Jeffrey Miron, visiting professor of economics at Harvard University, which says that replacing marijuana prohibition with a system of taxation and regulation similar to that used for alcoholic beverages would produce combined savings and tax revenues of between $10 billion and $14 billion per year. These estimates may be conservative according to the Marijuana Policy Project which is the largest marijuana campaigning organization in the United States. For example, Miron based his figure for prison costs due to marijuana prohibition on an estimate that one percent of state prisoners are imprisoned for marijuana related offenses. However a report released this May (05) by the 'White House Office of National Drug Control Policy' put the figure at 1.6 percent, acknowledging that tens of thousands of Americans are incarcerated in state or federal prisons for marijuana offenses. In Britain, the Blair government did a report into the annual cost of prosecuting nearly 100,000 people for cannabis possession, discovered it cost over £1 billion a year, and soon after brought in the 'Class C' policy, which ended most prosecutions for possession. They saved Britain plc £1 billion a year at a stroke. In the States the emergence of this economic report could well be the begining of major change as happened in Britain; as usual it's money that talks. So could we see George Bush legalising Ganja Bush? It is hard to imagine, but Bush seriously needs the cash so anything is possible. Also he used to smoke loads of weed, so he knows it's not as bad as his dad used to make out..
What ever happens, this new report, and the unusual public support it is getting from important US academics from both the left and the right, is an important development. It is now more likely that if there is a change in policy in the US, it will be to full legalisation including distribution and sale, rather than opting for the current British half way house policy of 'Class C' for possession, but supply still illegal. The Independent Drug Monotoring Unit in Britain has estimated cannabis could bring the government extra annual tax revenue of £606,889,748 for hash and £735,304,101 for skunk, plus the income from VAT. If cannabis was legalised and taxed in the US, we can be sure the British government will not be far behind the Americans - as usual. What won't be normal is that we won't be complaining, except when the Chancellor puts another 20 pence on an eighth in the Budget and only a penny on a pint. Then cannabis will be just part of our everyday culture. However, "anarchist" and right wing libertarian cannabis users who do not want to pay taxes need not worry; there will always be a dodgy 'blackmarket' as with tobacco and alcohol. And, if the government adopts the Cannabis Trust policy, as they will have to eventually, people will be able to legally grow their own organic, GM free, tax free, non corporate, totally PC weed, just like you can brew your own tax free wine or beer now. This is why, when we end cannabis prohibition, everyone wins! The annual London "Respect Festival" organised by the GLA, uncomfortably became the "Rise Festival" this year, only to be renamed 'London United' in the wake of the attack on the city by suicide bombers 10 days ago. The 'Cannabis Education Trust' ran a stall among the community stalls section at the event, giving us a chance to gauge opinions and experiences from a wide range of people forming the 100,000 audience. A fascinating range of nationalities, faiths and creeds were drawn to our stall - all eager for information and to share their experiences of cannabis and prohibition. Our leaflets were devoured by visitors of all ages. Teenagers arrived with parents in tow, parents brought their kids over for some honest cannabis education and a healthy debate ensued. Only two negative reactions were observed- one from an obnoxious drunken oaf who told us we were a bunch of "####'s" because we declined his demands for a free supply of weed; the other a decidedly sober woman who denounced us as "evil ##### liars" for not agreeing that cannabis causes cancer. Will there be a Brixton Cannabis Festival again? Where can I get organic (no-additives) tobacco to mix with my ganja? Why didn't the Panorama programme on Skunk and teenagers interview anyone connected with the Trafalgar Square Rally apart from the Rethink bloke? Why don't ya tell tha yout about real ganja and sinsy - and steer them away from chemical-ridden skunk and toxic 'soap bar' hash? Err got any free samples? Can you sell us a bit? How do you grow organic skunk? Is it true mushrooms are illegal and class A to possess? I wish we had honest cannabis education in Chile, many people still think it is like heroin and crack. My friend in Poland just got 6 months for possessing half a joint. A lot of us used to use cannabis on the Kibbutz. Did you hear about the guy in Singapore who was executed for half a kilo of weed? Thanks to everyone, including Ken Livingston, for a great 'united front' day. It was cosmopolitain London at it's best. The Cannabis Trust is planning a coordinated 'Hemp Aid' education campaign. A draft text for a suitable flyer has been produced and more research is being done. Help is required. We are looking for more information, especially regarding hemp in Africa, and US policy towards hemp. 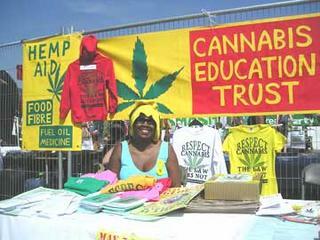 Once the text is fully checked and agreed it will become part of an ongoing 'Hemp Aid' education and action campaign. Further research is being done to find the exact legel situation regarding Hemp Farming in each African country. So far we have discovered considerable variation: In S. Africa the ANC government has long been aware of the value of hemp in alleviating poverty in Africa and is now investing millions in hemp production. However in Ghana you can get 10 years hard labour simply for saying (or singing) anything that could be construed as advocating the use of cannabis and that includes hemp! Just like the American Drug Enforcement Authority (DEA) which works all over the world spreading misinformation about cannabis and hemp, Ghana's government lumps hemp together with 'cannabis', and thinks that you can eat a hemp burger and get high! More information on current hemp policies in other African nations is urgently required. We are also looking for more evidence to back up the statements in the draft text regarding the imposition of an anti hemp policy on many of the poorest African countries by the US using blackmail, bribery and corruption. 'Hemp Aid' Flyer layup: designed for easy download, printing, photocopying and local distribution: hempaid.pdf (a4, '3up', b/w, 316k). Hemp in Afganistan: Hemp Could Replace Opium Crop - Hemp would provide a feasible and profitable alternative to growing poppies for heroin, argues development worker Marc Deeley talking to the BBC. Cannabis Culture have another interview with Marc Deeley, who works for 'Spirit Aid'.